Available with Spatial Analyst license. If the input locations for the Sample tool are specified as a point feature dataset, the point coordinates may not be the same as the cell centers of the cells specified in the input raster. To determine the values at the exact locations of the selected points, a resampling technique must be adopted. For discrete data types, the default Nearest resampling algorithm will be satisfactory. However, for continuous data types, it is more appropriate to perform another resampling technique. For instance, for elevation data, applying bilinear interpolation or cubic convolution will provide more accurate results. The bilinear option will determine the cell values based on a weighted distance of the four nearest input cell centers. The cubic option will compute the cell value based on the weighted distance of the nearest 16 cells. The Process as multidimensional parameter determines how the input rasters are sampled. If this parameter is checked, the input rasters will be sampled along all of their dimensions; otherwise, only the current slice of a multidimensional raster will be sampled. When the process as multidimensional parameter is checked, the sampled values appear in separate rows of the output table (row-wise output). 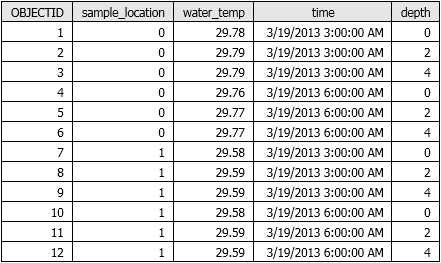 When the parameter is unchecked, sampled values appear as separate columns in the output table (column-wise). Row-wise output can be helpful when using the output table to create charts or graphs.